In order to make the best use of revision time it is important for a student to be aware of which topics they understand least well. They can then schedule more time revising these topics or be more specific when seeking help from others. 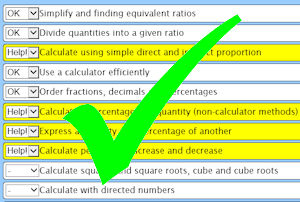 This part of the Transum Mathematics website contains a growing list of objective checklists for various common Maths exams. Transum subscribers can provide their own lists of objectives to use with this system. If you do not yet have an account and you are a teacher or tutor you can apply for one here. Begin by clicking the small round button next to the name of the checklist you need then enter a person’s name or class name in the text box provided. This will take you to the required checklist as a new web page. Copy or save the address (URL) of that page for your personal use. Please note that the information about the checklist is stored only on your local computer. No information is sent to the internet. The information you enter into your checklist will only be available on the computer you entered it upon. Teachers, parents and tutors can sign up for a 12-month subscription to Transum providing answers, features and ad-free access. Click the 'Print Help Version' button to show only the objectives you have classified as requiring help. Print this page.